As day go by, technology gets more sophisticated. You can always attest that before now, taking of pics or Capturing one's self via smartphones with flash, has to do only with the back camera, and those devices with front camera has no front flash but only at the back camera. As it may be, new smartphones coming out now has flash embedded on the front camera for selfies. As smartphone manufacturers tends to see to the fullest satisfaction of their customers. 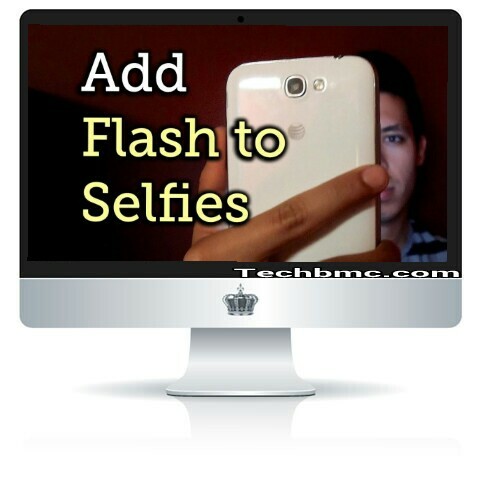 Now in this post, I will be guiding us on how to activate or make your smartphone front camera capture with flash. You may be wondering what you need the flash for, the flash can go a long way in capturing your image so bright especially at night or in a dark place. So if your front camera doesn't come with flash, read on to enable it when capturing your self. How To Enable Screen Pinning Feature For Android Devices. How To Use the Do not Disturb Android Option On Your SmartDevice. Without Octopus Box, Change Your Samsung Phone's Imei For Free. How To Unlock Nokia Phones Without Security Codes Using Our Expert Guide. For taking a good selfies at dark places with your smartphone without flash, then it warrants introducing you to one out of many apps available on Google playstore and Apple's Appstore that does the work. Before then, some of the apps that enables flash to your front camera includes; BestMe Selfie Camera App, Front Flash, Night Selfie Camera etc meant for Android O/S users. While for that of ios devices, you need to download - Self-shot – Front Flash Camera, Nightly, Take Selfies FREE etc. To make it easier for us, we will go with Self-shot app which is available on both ios and android platform. Now follow the steps outlined below in order to achieve the purpose of this post. When the app opens, it will automatically increase your device screen brightness to maximum with a white backlight. Just that moment, face your iphone front camera towards you and take a bright selfies as you so wish. On the process of using the app, a preview of the selfie is displayed on a small frame just at the top right end of the app interface. Finally, when you must have finish taking the selfie, you can now decide whether to save or delete the pics. That's all for activating iOS front facing flash. First, download the Self-shot app for android users from Google Playstore and install it on your device. With same steps we used above on iOS devices, also follow same process on your Android device. NB: You can't use physical buttons example, your android volume key or a physical camera button, it's just automatic as explained in the iOS steps. Got any contribution or question? kindly use the comment box below.